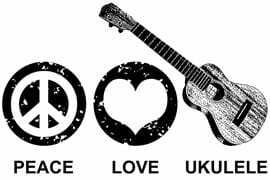 Did you know that we offer Ukulele lessons? As a matter of fact, we’ve got TWO ukulele instructors, Brendan and Austin! Many enjoy the sounds of this sweet little stringed instrument, but don’t know that the history of the Ukulele is actually quite interesting! People often assume the ukulele was invented in Hawaii, but it was actually invented by Portuguese immigrants that traveled to Hawaii to work on plantations! Legend says Joao Fernandes was one of the first Portuguese immigrants to voyage there and started playing his small stringed instrument as soon as they docked at Hawaii. The Hawaiians who saw Fernandes play his instrument were awestruck and thought his fingers looked like “fleas jumping over the fingerboard.” The Hawaiian name “Ukulele” was given after this occurrence, meaning literally ‘jumping flea’! Upon hearing the new instrument, the Hawaiian king, King David Kalakaua, became infatuated with it and since the king was so taken up by the new instrument, it became instantly popular among the Hawaiian people! King Kalakaua played a huge role in adopting the Ukulele into the Hawaiian culture officially by requesting this instrument to be played during formal Hawaiian events. Pretty cool huh!